Situated on the Ring of Fire, the ASEAN region faces one of the greatest threats of natural disaster due to geophysical activity along this active belt of tectonic plates. Following on from volcanoes in the last edition, another key disaster threat categorised into the geophysical type are earthquakes, as well as a range of related disasters that can occur as the result of earthquake activity. Earthquakes are another form of geophysical events that have triggered disasters in ASEAN during recent times. Therefore, understanding the varieties and impacts of earthquakes is important for disaster management across the region. The AHA Centre receives ongoing information regarding earthquakes as they take place across the region. Considered relatively unpredictable, earthquake occurrences are therefore more often than not the focus of both response and preparedness activities for the AHA Centre team. As with volcanoes, Indonesia’s geographical location sees it experience earthquakes of various sizes on an almost daily basis, with their impact highly dependent upon a range of influencing factors such as force, depth, location and vicinity to human populations and infrastructure. 9.1-9.3M earthquake (and resulting tsunami) with an epicentre off Aceh, Indonesia, that resulted in the loss of over 220,000 lives, and displaced millions across 14 countries, including Indonesia, Thailand, Myanmar and Malaysia. 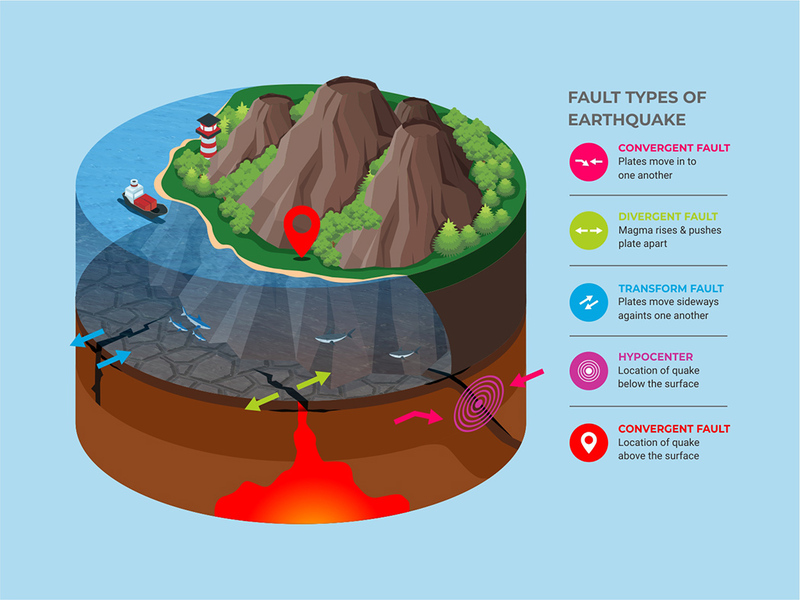 An earthquake, identified by a shaking of the earth, are most often caused by movement of geological fault lines (along the edges of the earth’s tectonic plates) – known as an inter-plate earthquake. The three main types of faults that can result in these earthquakes are known as ‘normal’, ‘reverse thrust’ and ‘strike-slip’ faults. The first two types of fault occur when two plates meet, resulting in movement that is vertical in nature (dip-slip movement). The third, strike-slip faults, are characterised by two plates meeting and sliding past each other horizontally. While most of the earthquakes we experience are related to these naturally occurring faults, earthquakes are also caused by other events such as volcanic activity, or human-induced occurrences such as mine blasts or nuclear testing. The power of an earthquake is measured by the use of the Richter scale, most commonly used to describe the magnitude (for example 6M or 6MR) and impact of a quake. An earthquake’s impact and force will decrease further from its epicentre, and also depend upon the location and depth of the initial fault occurrence. 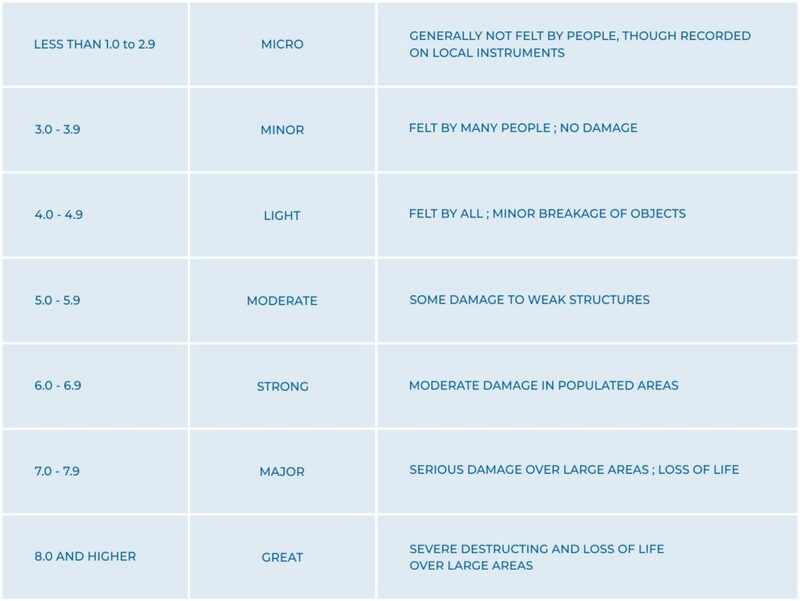 In general, earthquakes felt with higher magnitude measurement will result in greater damage, with general guidelines shown below. Aside from being powerful and deadly in themselves, earthquakes also lead to a range of other dangerous natural disasters. Well-known to the ASEAN region is the tsunami, which is caused by shallow earthquakes with an epicentre in the ocean, resulting in giant waves that make their way towards land. Alongside this, the shaking of the earth from a quake can cause landslides in hilly or mountainous regions, as well as phenomenon such as soil liquefaction, which was a major cause of death and destruction after the most recent earthquake in Central Sulawesi, Indonesia..